Wall Mounted LED Message Display and MP3 Player. Clients connect to the ESP8266'S on board micro web server to manually control the visual message/sounds and to configure the end points and credentials of remote api's and database servers, configure triggers for messages (and sounds based) on data retrieved from the remote requests. For example:- an on premise api is used to gather call rates, close rates and to monitor calls against Service Level Agreements in a sql database within a shared service/help desk team. The esp web server pages can contain status updates with detailed analytics for the team and their own private personal performance monitoring. Counts of open help desk tickets, closure rates, leader board, sla performance etc. The esp8266 can also display general status messages every x seconds on the 7 segment displays. Priority alerts, base on agreed aggregate values/ratios, are able to cancel general status message and display/sound alerts. LED Message = "1ST TODAY JAMES 73"
LED Message = "2ND TODAY MARY 70"
LED Message = "1ST WEEK CLAIRE 568"
LED Message = "1ST MONTH CLAIRE 1568"
LED Message = "Leader today . . . h e a t h e r . . 86% closed 1st call"
LED Message = "Patrick TOP .. C A L L .. R A T E .. 40/hr"
For example, if a customer had paid for a 2 hour fix gurantee and 90 mins after the first report the help desk has not solved the issue then the ticket is esculated to 2nd line support. After 80 mins the IoT wall display starts producing visible and audible alerts. X-- Service Level Agreement approaching 1st deadline before it will automatically be escalted. Support staff are paid bonuses for lower esculation rates. A support/help desk members that have zero esculations in a week are awarded with one of three prizes of the week such as a topic, mars bar or fruit pastals. Their choice, perk of the job :) Staff that go a whole month without esculation earn an extra 200 USD, staff that achieve higher than 85% 1st call close rate averaged over a month earn 200 USD. LED Message - "5 SLA Critical 20mins"
LED Message - "3 SLA Critical 10mins"
LED Message - "2 SLA Critical 3mins ...1.2.3.4....7.1.6.8...."
Critical trigger includes audible sound from a USB stick insertered into the MP3 device. 5" speaker(s) connected to the MP3 via a small amplifier breakout board gives enough sound to raise awareness without being distracting. A random playlist for different types of events could be configured to keep things a bit more fun. For example playing "damn busters music" if ticket closure rates rise rapidly is an easy choice but it might be interesting to study what type of sound might help raise the pace during demotivated or slow times. It behaved very well and accurately scrolling text and numbers accross 8 x seven segment displays, whilst also controlling an MP3 player, polling a web server for data and responding to remote user requsts via the web pages we uploaded to its onboard micro web server. The Adafruit HUZZA ESP8266 costs just $10. 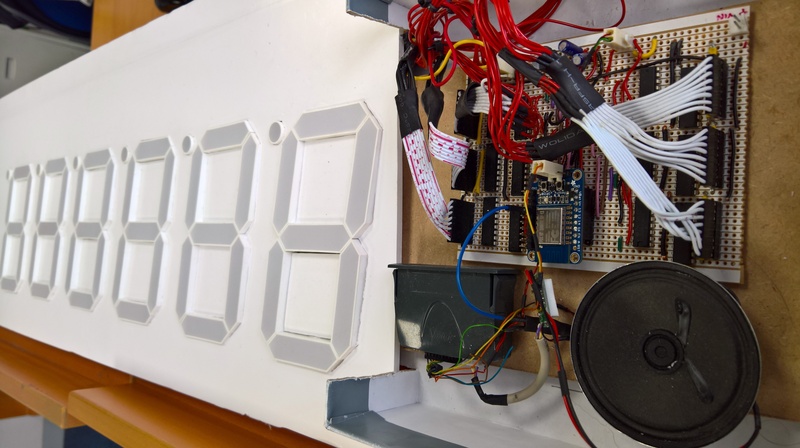 A collegue used one to build a wirelss wall mounted status and alert IoT device. Images below. 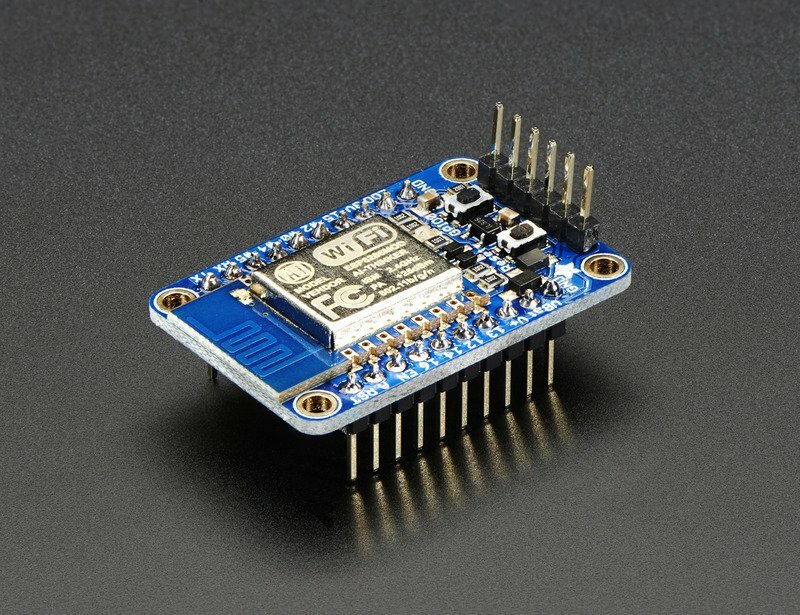 The ESP8266 can join an existing WiFi network and/or create it's own network. The ESP8266 also has it's own web server and a small but useful amount of file storage for web files. Mobile and other wifi users can connect to the ESP8266's web server and/or network. The ESP8266 can serve dynamic web pages (or static web pages, images, scripts etc) from it's own memory or with additional ahdrware from other storage devices such as sd cards. The ESP8266 Arduino code can respond to user actions within web pages pages in the same way as a normal web server. Actaually the ESP8266 has some quite sophisticated networking capabilities such as the ability to create TCPIP clients and servers on multiple ports and is designed to serve multiples simultanious client connections. The ESP8266 can also be programmed over wifi making it easy to imporve or change functionality without having to dismantle and move close to a pc/usb. After a program update is sent over the wifi the ESP8266 server and wifi reboot/restart which only takes a a few minutes. Adafruit took the difficult to solder and difficult to use ESP8266 and put it on an easy to use breakout board with voltage regulator, level shifting and the usual things that make a resiliant Arduino style board with reset button, ftdi cable compatible pins ++. That's what a HUZZA is. Adafruit manufacture a huge amount of very cool and creative stuff. Better still they also provide some of the highest quality documentation and tutorials to support their own products and also to promote the worldwide learning of electronics. The ESP8266 Arduino compatible micro-controller with on board wifi has been a huge hit probably for two reasons. 2) Creation of Arduino compatible api/core by @ESP8266Community to a depth, maturity and standard not previously seen in the Arduino world outside of more advanced larger development forces of Texas Instruments or for more powerful microcontrollers.